The Radnor Recreation Department & Radnor Memorial Library have teamed up to deliver Truck Zoo! This is a family-friendly event where kids can climb in and experience hands on real-life fire engines, police cars, construction trucks and more! Learn how they operate and what they are used for. Other activities include children’s story times, craft projects, entertainment, snacks, giveaways, and more! 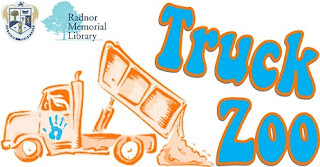 Truck Zoo is sure to be fun for all ages and is free for the community to attend!